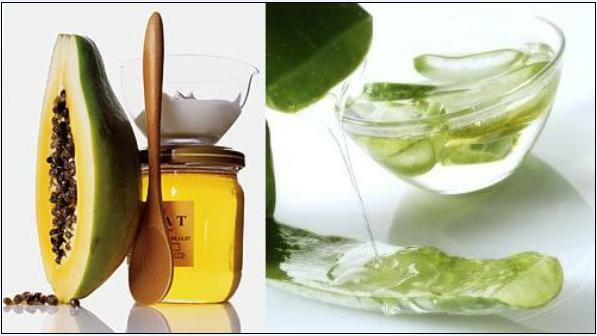 Papaya Aloevera facepack reduces acne,pigmentation,dryness and adds a glow!! Papaya was rightly called the fruit of the angels by none other than Christopher Columbus himself !! It is truly a powerhouse bursting with natural nutrients ,not only for the skin and hair but also for overall health.Papaya has a treasure trove of restorative as well as preventive properties to rejuvenate skin&hair beautifully. The fruit enzymes of this fruit-papain are widely known to heal acne and are great for skin exfoliation.Papaya is an extremely rich source of Vit C,Vit A ,anti oxidants,folate,panthothenic acid,potassium ,magnesium and most important of all beta carotene – which is why it is such a beneficial skin food. HOW PAPAYA WORKS ITS MAGIC :Papain exfoliates by breaking down surface dead skin cells and makes it easier to remove them,revealing fresh skin&the moisture underneath and reducing dryness as well. The papain also helps to break down the skin on top of the blemish,hence it is also used to treat pigmentation and blackheads by removing any blockage and helping to break down the dead cells inside the pore.When you remove dead tissue during exfoliation,you make your pores seem smaller as the keratinized skin around the edges of your pores is removed and makes them less visible. This papaya,aloevera &honey mask is my all time favourite natural face mask to get back the glow instantly. Method:Apply a mixture of 2 tbsp papaya pulp,1 tbsp aloevera gel&1 tbsp honey to the face.Optionally you can add 1 tbsp of milk cream to the blend.Wash off after half an hour.Pat dry. The ripe papaya fruit contains the enzyme papain which is a potent anti inflammatory agent and hence is beneficial against acne.It is also a very good exfoliator,removing dead cells ,softening and smoothening the skin.Papaya contains Anti oxidants like beta carotene are phyto nutrients essential for young-looking,glowing skin. Take half a cup of ripe papaya pulp; add 1-2 tablespoons of orange juice, 1-2 tablespoons of curds. Mix well and apply on your face and neck.Wash off after half an hour.Pat dry gently. The luscious brightly coloured papaya is a storehouse of beta carotene ,a very important anti oxidant .Oranges have astringent and toning properties and improve the skin texture and color due to their high Vit C content. They also help in skin firming and preventing early aging by promoting the formation of collagen. Reduce acne and open skin pores by massaging with raw papaya.Raw papaya contains papain in higher concentrations than in ripe papaya. As you know raw papaya is used as a meat tenderizer,as it has the ability to break down skin cells.